Hermosa Beach is one of the four beach cities that make up the Los Angeles South Bay - Manhattan, Redondo and El Segundo. It's motto: "The best little beach city." The city has a small population of just under 20,000, but attracts folks from all over to busy Pier Avenue, which is closed off to motorists, and consists of many popular bars and restaurants. Summer in HB can attract tens of thousands on weekends, especially on busy times like Fiesta Days and 4th of July celebrations. When not partying, Hermosa is known for attracting surfers, cyclists, roller blading enthusiasts, skateboarders and the like. Cigarette smoking is banned in HB, but local police rarely cite smokers. Hermosa was founded in 1906 when city officials were elected. In 1906 the first pier was built, extending 500 feet onto the ocean. In 1907, according to the local Chamber of Commerce, the city acquired ownership of its 2 mile stretch of ocean frontage, via a deed from the Hermosa Beach Land and Water Company. "The deed stated that it was to be held in perpetuity as a beach playground, free from commerce, and for the benefit of not only the residents of Hermosa, but also for the sea lovers of Southern California." 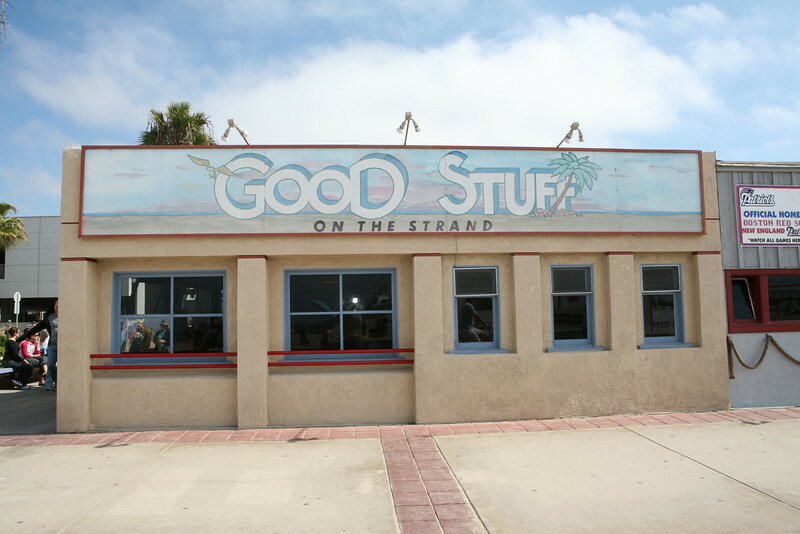 Good Stuff, serving healthy and great tasting food right on the Strand. Burgers, wraps, salads and fabulous cookies. Our favorite--Cris's Breakfast Salad--lettuce, eggs, turkey, black beans and rice.